"It was very clean and spacious." 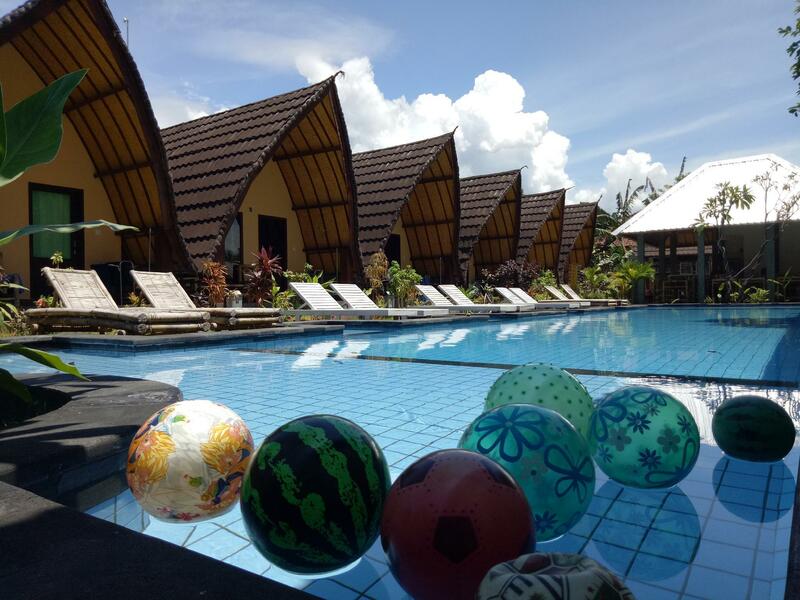 Have a question for Gili Cemara Bungalows? "The free breakfasts were also great, especially the banana pancake." "Breakfast was varied and tasty." "Stayed 1 night very good breakfast was good staff brilliant..."
Well-positioned in Gili Air, Gili Cemara Bungalows is the ideal point of departure for your excursions in Lombok. From here, guests can enjoy easy access to all that the lively city has to offer. With its convenient location, the hotel offers easy access to the city's must-see destinations. 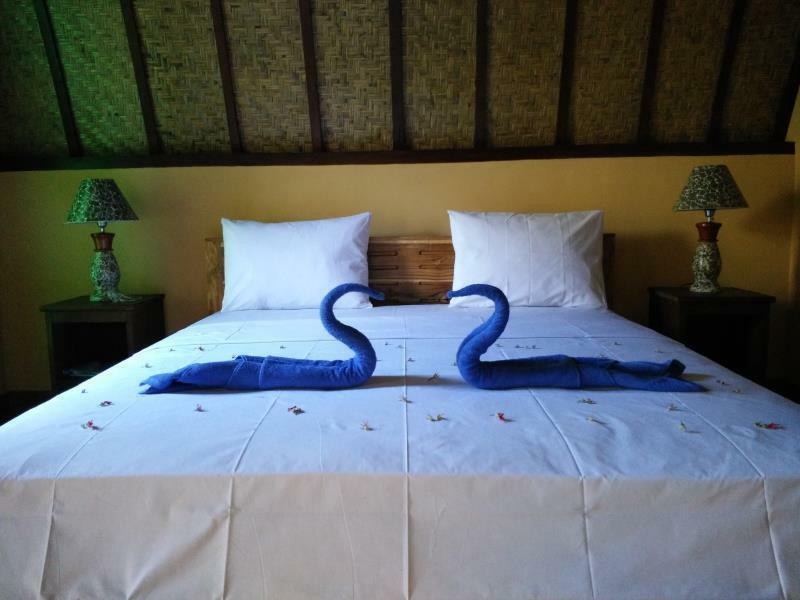 At Gili Cemara Bungalows, every effort is made to make guests feel comfortable. To do so, the hotel provides the best in services and amenities. Free Wi-Fi in all rooms, daily housekeeping, 24-hour security, Wi-Fi in public areas, car park are just a few of the facilities that set Gili Cemara Bungalows apart from other hotels in the city. 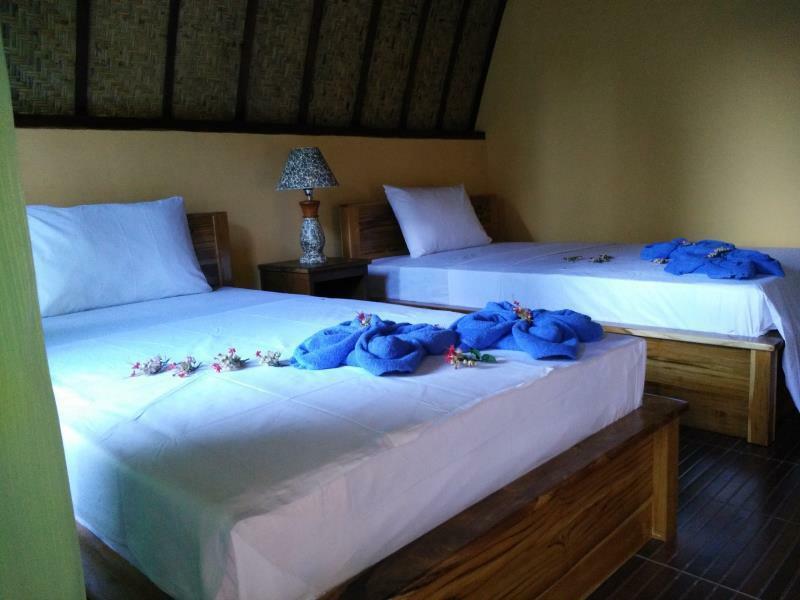 Gili Cemara Bungalows is home to 10 bedrooms. All are tastefully furnished and many even provide such comforts as linens, mirror, towels, umbrella, internet access – wireless (complimentary). Besides, the hotel's host of recreational offerings ensures you have plenty to do during your stay. Enjoy unparalleled services and a truly prestigious address at the Gili Cemara Bungalows. "Cemara is a simple, clean, comfortable little series of trad..."
Most of the time there was no one at the desk. When we arrived we had to ask the people around, so someone finally showed up. Some people next door (owners?) had a small picknic/gettogether at the pool side which is ment for the guests. And they also played their music loudly (from their house) which was annoying. Also the bungalows are in the straight line of the mosque and those loud singing noises every couple od hours were disturbing. Nothing against their religion but i came there ill and really tired and in desperate need of a rest.. and that singing going on what seemed for hours, was a real no go.. The girl who worked there was actually really nice.. but they should have someone there for the guests at least from 8-18 like in most of the places. Pool side was nice. Bathroom was not. All in all they could make a bit more of an effort. Amazing pool and great location. Dirty bathroom, but good enough for lowcost accomm. We enjoyed our stay here, with free breakfast cannot beat the price, but the only down side is no television in this accomodation. Beautiful luxury bungalows, good a/c, lush bed, best swimming pool in SE Asia!! Breakfast was varied and tasty. Bagus - the guy at reception was a great, taught me some of the language. Right near the port but super quiet. Would recommended to everyone! It was an ok type on bungalow. Very nice pool. Breakfast was very average (toast ja eggs). Bathroom was very dark and smelled moist. Hot water fron the shower :) You can hear the muslim prayer call every few hours (in the night around 4 am i think), the mosque is very near. Staff was friendly but most of them didnt speak english very well. Cemara is a simple, clean, comfortable little series of traditional houses with ice-cold AC, a large pool, and attentive staff. After hiking Mt. Rinjani, I came to Gili Air expecting to rest and perhaps be a little pampered. This is one of the comfiest hotels I've stayed in while traveling Asia. I had a twin room to myself. It was very clean and spacious. The bathroom was very large and had hot water (which was very needed after hiking Rinjani!). The free breakfasts were also great, especially the banana pancake. The wifi was decent (island-quality--it can be hit or miss), and the pool outside was great. They also have a laundry service, and the staff are super friendly. Stay here if you come to Gili Air! It is easy to go there with a suitcase. Only 5 min. walk from the harbour. The place is very nice with the pool. The staff is very friendly and you can book tours there for the same price like at the harbour. The room is clean and the bed very comfortable. For breakfast you can choose different food. It is not huge, but enough. Bars or restaurants are not far away. But don't forget a torch. I would stay there again. Gili Cemara provided for all our basic needs. Clean room & toilet, good air conditioning. Pool was big enough to swim laps (in length), although we didn't use it. Basic breakfast, but good enough. 3-5min walk to the main strip. Overall good for the price we paid. A bit pricey, nice pool, reasonable air-conditioning. Not far from ferry port. Very flaky electricity. Nice breakfast. A very nice place . Beautiful bungalows with hot shower and AC. Pool was clean and big . There were beach chairs enough for everyone. The staff was nice and friendly. good in relation to the beach , and restaurants . The Bungalows are only 5 minutes located from the harbour. They have a pool and every bungalow got it's own little terrace, where the breakfast is served every morning. They make very nice breakfast, not too much choice. Everyone was always happy to see us, they even tried to remember our names. We spent 3 nights there, maybe the room should be cleaned at least once. That's the only negative point. You even get there warm water! Good place in the heart of gili. The beds are good amd the rain shower is good as well. They are building the reception and restaurant at the moment. Thr staff is very friendly. The only negative point are the noices from roosters around the hotel. Estuvimos una semana, el hotel es nuevo, con 9 bungalows llevado por una familia. La habitacion es grande y bonita, cama enorme, aire acondicionado y piscina. El desayuno es muy completo. No hacen la habitacion ningun dia y tampoco hay colgadores para toallas ni armarios. Repetiriamos sin dudar. Mis à part la petite réceptionniste le personnel est hyper désagréable ce qui rend cet hotel sinistre d'autant que nous avons termine seul client . Petit dej cuisiné sans conviction et consommé dans plaisir. Hôtel a eviter. Seul intérêt : sa localisation près du port et des restaurants. Par contre la proximité de la mosquée vous épargne la nécessité d'emporter un réveil, à 4h30 du matin c'est l'appel à la prière jusqu'à 5h30....pour les adeptes c'est parfait, pour les autres les boules Quies et la tête sous l'oreiller .